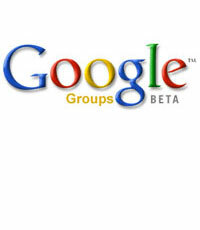 Google Groups (http://groups.google.com/) is a free archive of Usenet postings that also allows Google account holders to post to newsgroups using a web interface. As such, it offers a practical alternative for anyone who is unable to install specialised news software or who has restricted Net access. You can read most Usenet newsgroups via Google Groups without signing up for the service, but if you want to post to one of these groups post, you'll need to create a Google Account by selecting the "Join" link on the Google Groups homepage. However, you should be aware that the some of the discussion groups that can be accessed via Google are not part of Usenet but are specific to Google Groups itself. More importantly, the manner in which Google Groups handles some common tasks such as responding to a previous Usenet post can cause considerable problems in some groups. Fortunately, most of the problems can be avoided by following a few tips. If you try to reply to a message using Google Groups' standard method, your reply will not automatically quote and attribute the previous post as per the accepted conventions within Usenet. However, just above the message you wish to reply to, next to the original poster's name, select the "show options” facility. Once the list of options has been revealed, select the "Reply" option and proceed as normal. This method of replying has been reported to work correctly with regard to both automated quoting and attribution. Some newsgroups use their own, internal, tagging system to categorise posts. Tagging invariably involves the inclusion of specific codes, or letters, within the Subject line of a post to indicate its category. For example, a common convention in many groups is to indicate that a post may be off-topic by adding the code [OT] at the front of the Subject line. In high volume groups, where the number of daily posts may be upwards of 250, tagging offers a valuable way to filter posts within news software based upon their category. Posting guidelines in these groups may even insist upon tag usage and failure to abide by the guidelines can result in angry responses. Unfortunately, you may not notice group-specific tags, initially, as Google Groups hides them within its default view, but you should be able to see them, within the Subject line, using the "show options" facility at the top of each message. The real problem, though, starts when you want to reply to such a tagged post. Google Groups insists upon automatically removing the all-important tag! The solution is simple, if a tad inconvenient. Type the tag in the Subject line manually after the "Re:" and before the rest of the subject. If you ensure that there is no whitespace on either side of the tag, Google Groups should remain blissfully unaware of your changes and won't remove your manually applied tag when you actually post.